What is our Internet Marketing Coaching and Consulting Program? Our Coaching and Consulting Program is a unique approach to internet marketing success for the small business. It’s individualized for your specific business goals and aspirations. It’s simple: we provide you with smart, insightful coaching. You stay in complete control of your marketing while getting the benefits of our professional insight, recommendations, and strategies. We also help you through the technical elements of your marketing during the consulting & production phase. We can perform work that you otherwise wouldn’t be able to accomplish independently. Then, at the end of the month is your follow up session, where we review your progress and any questions you might have about the month’s internet marketing agenda and tasks. The coaching session takes place via phone or web meeting (such as Skype or Google Hangout). This is where we look at where you are, where you’ve been, and where you want go. This conversation will establish your marketing agenda for the month, or continue topics from a previous month. We provide you with a summary email that reviews the topics discussed and outlines related action items. During the consulting & production phase, we address the hands-on marketing tasks you need our help with. This may involve work like making changes to your website, social media profiles, or preparing meaningful and actionable reports. During the follow up call, we discuss the success of the month’s agenda and tasks. You have the opportunity to ask any additional questions you may have. One small business group needed to make sure they were using their marketing efforts efficiently. We helped them to understand how to better use their Google Analytics data to determine which channels were performing well for them and which weren’t. In the process we helped them set up new goal and event tracking, and created custom dashboards so they could jump in and see “at a glance” how different channels were performing month to month. During the follow up call we discussed modifications they could make to better align their marketing efforts with the new insights being gained though analytics. We had a client with a fantastic website, but it lacked any call-to-action or lead generation. We helped him to conceptualize and develop a key lead generation form with “instant quote” capabilities. During the follow up call, we recommended customer relationship management (CRM) solutions to make the most of the new leads he was now getting through his website. One client wanted to grow their email list. We discussed their current approach to encouraging sign ups to their newsletter, and discovered the sign up form could be readdressed in order to increase visibility, and sign ups. We designed and optimized a new, appealing sign up form to attract new sign ups, and integrated it seamlessly into their existing website design. During a later follow up session, we helped them review the before-and-after to determine the success of the new form. Another client wanted to branch their products out in a new direction. We performed keyword research to determine the popularity of their new product, and also the level of competition she could expect. We developed recommendations for her, allowing her to launch her new product in an informed, smart way. During a later follow up session, we were able to help her understand the performance of the new product launch, and suggest additional strategies for competing in this new market. We discovered that a client was missing opportunities to acquire new prospects through their Google+ Local Profile. We discussed how to claim the profile, and the important optimizations that would lead to a more predominant listing. We performed category research to identify the best categories for their business, added their photos and videos, and optimized the copy in the businesses description. During a follow up call, we helped the client understand how many leads were generated from their now optimized Google+ profile. 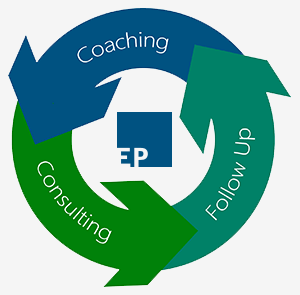 We offer two levels of our Coaching and Consulting program. The Basic level is great for a small business owner that wants to get moving in the right direction. The Advanced level is perfect for an established business that’s looking for a more comprehensive approach to their internet marketing. Who is Enhanced Path Marketing? Enhanced Path Marketing is a full-service internet marketing company. We focus on smart, ethical, and modern marketing strategies to make sure our clients get the most value out of their marketing campaigns. In business since 1996, we are well-established, experienced, and professional. Over the past 17 years, we’ve helped hundreds of clients grow their businesses through online marketing. We are dedicated to the success of our clients, because the truth is: Your success is our success.